Today I have joined a bunch of friends in bringing you a plethora of beautiful and tasty bite ideas to enjoy Valentines Day at home. I know we talked the other day about staying home on Valentines Day instead of braving the restaurant/try-to-get-a-babysitter scene. I think you can create an even more special romantic dinner for two at home (or at least a cute dinner with your kids if you are me). So here is one idea (for a side dish or a main course) to go along with the delectable Roasted Asian Shrimp Cocktail I posted on Moday. 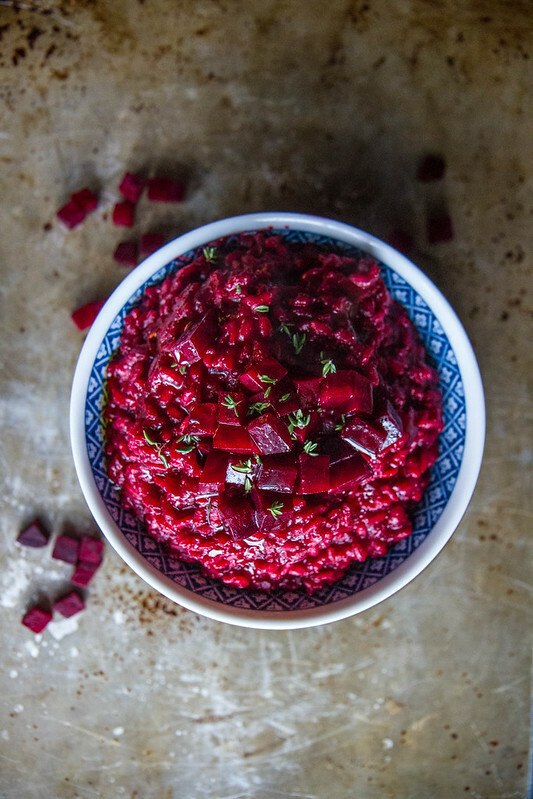 Beet Merlot Risotto, a darker, richer take on traditional risotto that is not only completely show stopping in color, but totally delicious. And another thing. I am so impressed with how risotto is able to take on a true creaminess just from the rice being stirred so vigorously- there is absolutely no dairy in this whole recipe which makes my body happy. If you are not inclined to be dairy free, than by all means stir in a few tablespoons of butter at the end and top with a pile of parmesan and then shovel it into your mouth. If you are like me and have to share your man/woman with your kids on Valentines day, than be assured, even your kids will appreciate this dish- even if it is just solely based on the color. The alcohol will burn off or you could always swap it for an extra cup of broth if you don’t drink or it makes you a nervous nelly. Either way it will be great. To enjoy more ideas for what to serve your loved ones, just check out the links below for a bunch of wonderful ideas from breakfast to dessert! Bring a large pot of salted water to a boil over high heat. Reduce the heat to medium and add the beets. Simmer until fork tender, about 20 minutes. Drain the beets and rinse under cold water, rubbing off the skin under the cold water. Rough chop 2 of the beets and add them to the bowl of a food processor. Add the garlic and the olive oil and pulse until you have a smooth puree. Season to taste with kosher salt and set aside. Dice the last beet and set aside. In a large pan over medium heat add the 4 tablespoons olive oil and the onion. Sweat the onion, stirring often about 5 minutes. Add the rice and stir to coat the rice with the onion and oil. Cook stirring often for 2 minutes. Meanwhile bring the stock to a simmer over low heat in a small pot near by the pan. Add the wine to the rice and stir, scraping any bits from the bottom of the pan. As the wine cooks off, add a large ladle of stock and continue to cook and stir. As the stock cooks off, add another ladle of stock. Continue this process of adding stock and cooking it off, stirring continuously. When you are about 15 minutes in and have added most of the stock, add the beet puree and after 2 minutes add the rest of the broth and continue to cook another 5 minutes or until the rice is tender and cooked through. Season to taste with kosher salt. 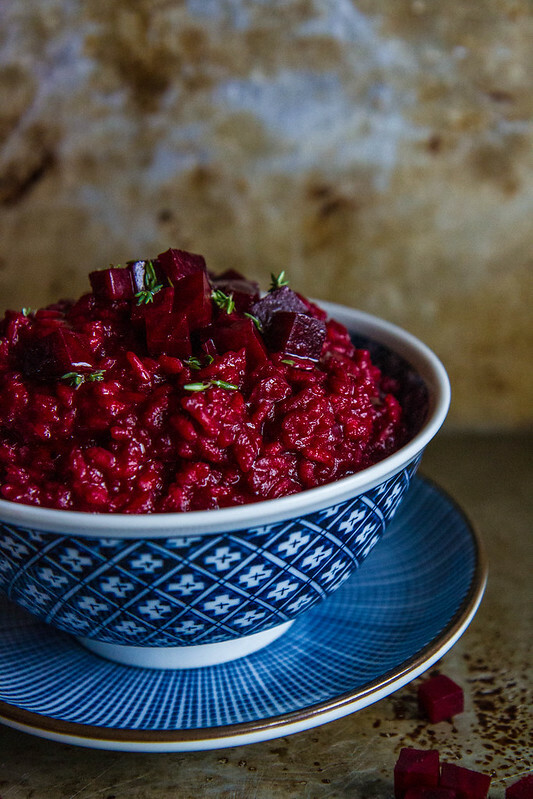 Spoon into serving bowls and top with the diced beets and a drizzle of olive oil. Garnish with fresh thyme or finely minced flat leaf parsley if desired. Wow! Look at that color Heather! Beautiful dish!!! BEAUTIFUL! That deep color is to die for!!! I absolutely LOVE this color!! Ahh, such a pretty dish and perfect for Saturday!! What a gorgeous colour! Perfect for Valentines Day! Ha! I’m with you about avoiding the Valentine’s Day dinner mad-dash. Although we always do ours a few days before or after to avoid that mess. But for the day of-home cooked dinner for sure and this looks and sounds fantastic! The COLORS, oh my gosh! 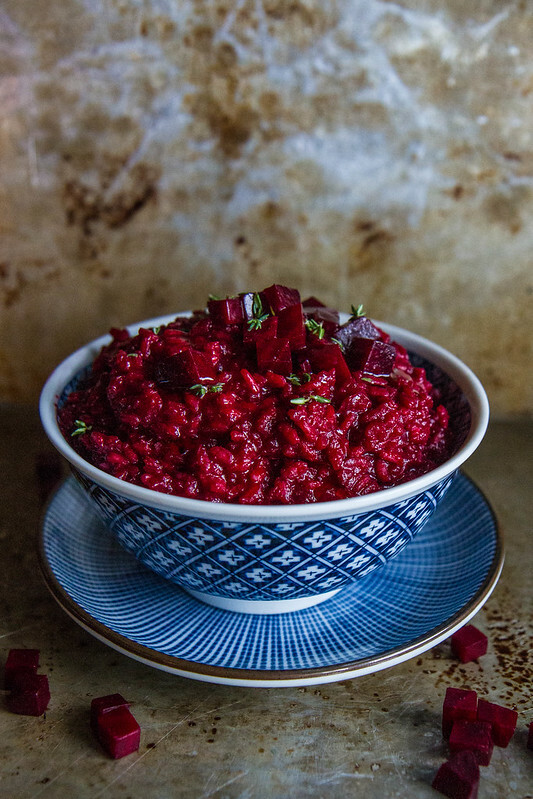 Ben and I love beets – they are so underrated, I think I found our Valentine’s Dinner dish right HERE! I can’t wait! lol! I think it truly is the pinkest EVER! GOODNESS gracious. I absolutely have to do this. The end. Love the color of this dish!! Fabulous ~ must try!! That is gorgeous, Heather! And I love that its dairy free–yum! You are so right. The color is intoxicating. Wow! Pingback: Vegetarian, Gluten-Free Roundup: Surprise! Chocolate! shoot! Sorry Kristen- 5 cups! Would it be fine to leave out the wine? Cooking for my 10 month old. He loved your roasted tomato and corn risotto with arugula basil pesto!